PRICE PRICE: $79.95 + POSTAGE! 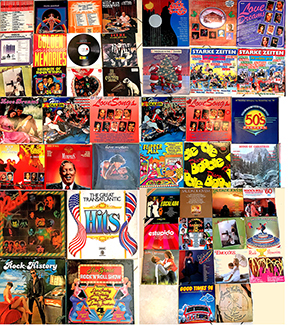 COMMENTS Below (and pictured-click on small photo for a larger view) are around 77 single (2 LP sets) LP's + 4 box sets of various artist / Elvis and promotional LP's in one batch! Buy them at the prices listed or buy ALL for $175 + postage! Please click on the photo for a larger version of some. - TLP 60298 LA MUSICA DE MOCHIN MARAFIOTI (RADIO MITRE). 1988 NEW BLACK RCA VICTOR LBL. VERY INTERESTING VAR ARTIST LP (ELVIS DOES BS SHOES AND JAILHOUSE ROCK) IN THAT THE FR0NT CVR SHOWS A PIC OF A DJ WORKING BUT WITH THREE ELVIS LP'S IN FRONT OF HIM ON HIS DESK !!! MINT - / CLOSE TO MINT -. $10. ALL MINT -/ MINT - OR CLOSE TO IT!! - 107.4028 SAUDADE JOVEM. ORANGE RCA VICTOR. 1975. LOVE LETTERS. $4 YES I KNOW IT MAKES NO SENSE AS VOL. 1 HAS AN EARLIER CATALOG NUMBER!!! - 104.4081 ROCK N ROLL '60.ORANGE RCA VICTOR. 1976. ARE YOU LONESOME. - 1-10 LAS GRANDES ESTRELLAS DEL ROCK. GREEN "SARPE" LBL. THIS WAS A LEGIT 10 LP BOX SET ISSUED BY THE LOCAL SPANISH MAGAZINE "SARPE" IN 1982. IT WAS A VARIOUS ARTIST SET WITH ONE COMPLETE LP ON ELVIS. 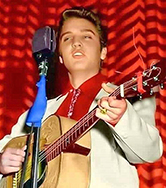 THE OTHER ARTISTS WERE LITTLE RICHARD; CHUBBY CHECKER; MARTHA REEVES; SAM & DAVE; THE ASSOCIATION; DRIFTERS PAUL ANKA; EVERLY BROTHERS; AND MANY OTHERS BUT NO ONE EXCEPT ELVIS GOT A SPECIAL LP BY HIMSELF. THIS COMES WITH A 20 PAGE MAGAZINE WITHA COLOR PIC OF ELVIS WITH BLUE JUMPSUIT ON THE COVER AND A 4 PAGE ARTICLE WITH PICS INSIDE. ALSO INCLUDED WAS A POSTER ADVERTISING THE COMPLETE SET. HOWEVER, THIS BOX SET ONLY COMES WITH THE ELVIS LP AND NONE BY THE OTHER ARTISTS. MOST COLLECTORS HAVE NEVER HEARD OF THIS BEFORE. FROM COVER HAS SMALL COLOR TINTED PICTURES OF A LOT OF THE ARTISTS INCLUDING ELVIS (LP FANS ONLY CVR PIC). BACK COVER IS JUST BLACK. THE SONG LISTINGS ARE ON THE INSIDE FRONT COVER. MINT - / VG 3 EXCEPT THERE ARE SHIPPING SEAM SPLITS AND CORNER BENDS. A STEAL AT $30. I HAVE ONLY THE ELVIS LP AND THE BOX AND INSERTS AVAILABLE TO SELL!! PRICE $300 FOR THEM ALL. IN FACT I MAY HAVE MORE THAN 1100 BUT I'M NOT ABOUT TO COUNT THEM! COMMENTS This special picture cover was made by RCA for me (WORLDWIDE ELVIS) many years ago. The only problem is that to make the cost economical I had to do 5000 so I must have 3000 + left. They make great sleeves for records that never had any. Please click on the photo for a larger version of the front and back cover. COMMENTS NINE LP SETS THAT BROOKVILLE MARKETING ISSUED IN THE 1970'S. 4 COPIES ARE ON THE ORIGINAL BLUE LABEL; 4 ARE ON THE TAN LABEL; ONE IS THE HARD TO FIND GOLD VINYL VERSION! - 4 COPIES. DPL2 0056e ELVIS. RCA SPECIAL PRODUCTS (BROOKVILLE) 2 LP'S . ORIGINAL BLUE LABEL!! - 4 COPIES. DPL2 0056e ELVIS. RCA SPECIAL PRODUCTS (BROOKVILLE) 2 LP'S . TAN LABEL!! Please click on the photo for a larger version of the front cover. COMMENTS In 1997, WORLDWIDE ELVIS in conjunction with BMG, released this RCA VICTOR 45 RPM single (the first one in years!) 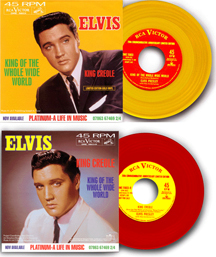 on RED and GOLD VINYL both with totally different picture covers on BOTH sides. I am only showing one side. If you'd like to see the flip just e mail me. Please click on the photo for a larger version of these.